KATHMANDU, March 25: Preparations for the Nepal Investment Summit 2019 scheduled for March 29-30 in Kathmandu have neared final stage. The two-day event aims to bring in foreign investment in big projects and thus creating a base for making the country prosperous in the aftermath of the government’s promise for ‘prosperous Nepal, happy Nepali’. The objective of the summit is not only to give a message about the creation of atmosphere for investment by welcoming over 600 investors from 40 countries to home, but also attracting and convincing them to invest, said the government which plans to present a list of 66 projects ranging from Rs 640 million to Rs 350 billion for investment before them during the summit. Energy, physical infrastructure, agriculture, information technology, industry, health and education and tourism are the areas of special focus for investment. Eight big projects have been selected by giving special priority to energy sector that the government has recognized a major base for achieving prosperity. Nalgadh Hydropower Project; AR-6; Sunkoshi II and III; Tamor Water Reservoir Project; West Seti; Lower Arun; and SR-6 have been listed as projects for joint –venture. 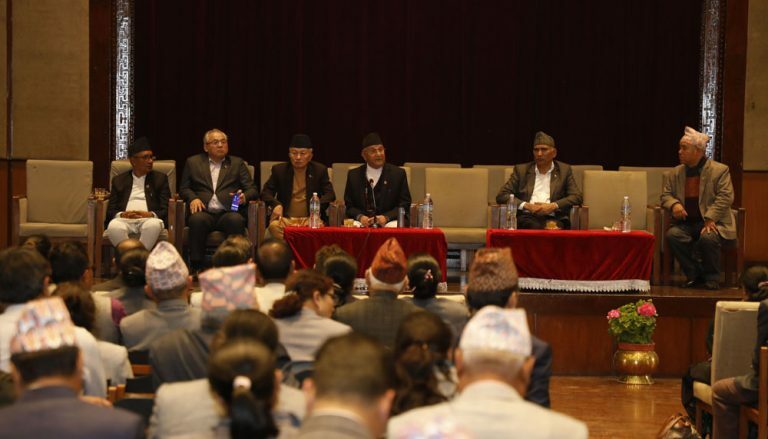 According to the Nepal Investment Board, the list of projects worth Rs 3.1 trillion was finalized just Sunday. The Board owns up the responsibility of coordinating the summit. The Board will inform the summit about latest progress about the 456-megawatt Upper Tamakoshi Hydroelectricity Project. This time, investors will be provided a complete package about projects, instead of sharing information only on theoretical aspects as the government is determined to make it a promising one. This summit will be different from the past one, Board CEO Maha Prasad Adhikari said. Prime Minister KP Sharma Oli has been invited for the inauguration of the summit. Similarly, ministers of different ministries and industrialists would brief about Nepal’s recent situation and investment environment. Addressing a meeting of Nepal Communist Party Parliamentary Party at Federal Parliament Building at New Baneshwor today itself, Prime Minister Oli expressed the belief that the investment summit would be concluded in an enthusiastic manner and foreign investment would be brought in as per the government’s expectation. It is believed that the summit, going to be organized at a time when a stable government has been formed in the country, would play crucial role to identify government’s goals of economic prosperity. The Federal Parliament has passed the Public-Private Partnership and Investment Bill with an objective of creating easy and smooth environment to foreign investors. Similarly, the Federal Parliament has already passed Bill to amend and integrate laws related to foreign investment and technology transfer, Bill designed to amend Special Economic Zone Act-2073. Projects like East-West Electric Rail, Kathmandu-Pokhara Railway, Kathmandu Metro Rail and Gautam Buddha International Maternity Hospital, carrying out study by the government, would be presented as ‘showcase’ in the summit. Similarly, projects–Trishuli Galchhi, Upper Chameliya, Myagdi Khola, carrying out study by the private sector, are also the attractive projects. Service would be provided to investors through single point at the Investment Board with an objective of providing easy service to them. Preparation has been made to sign agreement with some projects in the summit. The summit organized by inviting investors of many countries has multi-dimensional importance itself. A total of 173 billion in foreign investment has been brought in within seven months of the current fiscal year.